Today I decided to make my boyfriend his favorite chocolate cake. It is a recipe by the Danish chef called Gorm Wisweh. Gorm owns several bakeries and pizza restaurants in Copenhagen, but I have to admit I have not visited any, yet. First, place a bowl over a pot of hot water and melt the butter. Then, break the chocolate into pieces and melt it together with the butter. Next, set oven temperature to 160 C/320 F.
Then, add coffee (optional) to the chocolate and mix together. Then, add a pinch of salt, pepper, and 1/2 tbsp cocoa powder to the chocolate mixture and stir together. Fill pot with cold water and place the bowl of chocolate on top to cool. Then, whisk egg, sugar, and flour together with a hand mixer. Set aside. 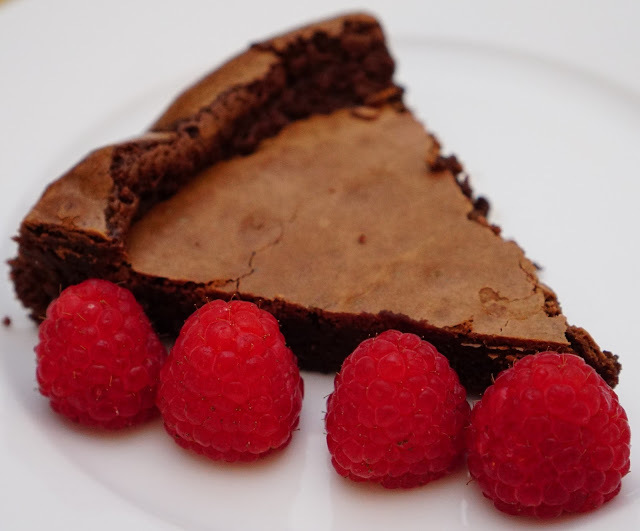 While chocolate is cooling, prepare the baking dish by taking some baking paper/parchment paper and placing it in the baking dish to prevent sticking. I used a round spring form cake pan. 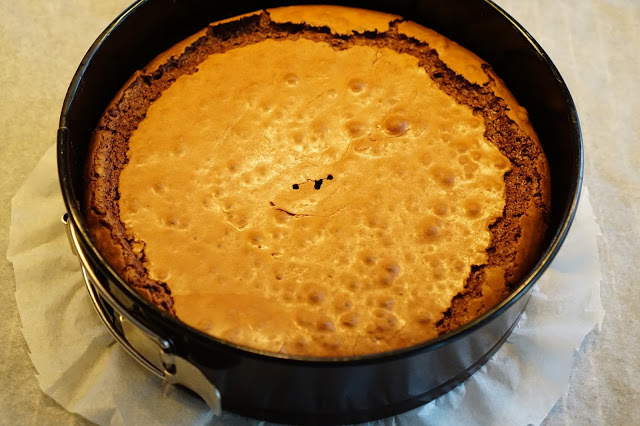 Finally, check to see if the chocolate is no longer hot and then gradually add the egg mixture to the chocolate mixture and whisk with a hand mixer until it develops and looks airy. Then, pour the cake batter into a baking dish and bake for 40 - 50 minutes or until a toothpick inserted comes out clean. Once baked, remove the cake from the oven and let it collapse. If it doesn't on its own you can tap it on a table. 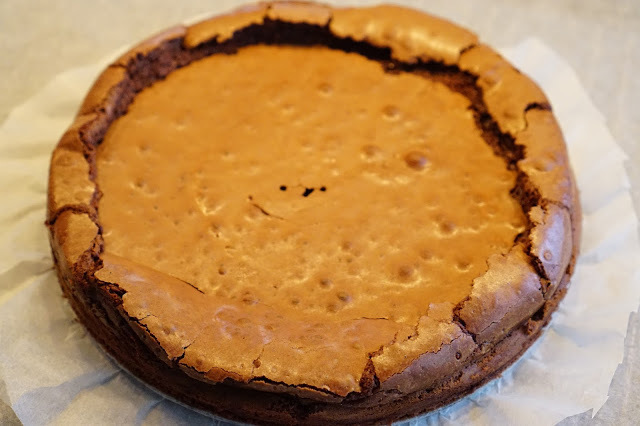 If you used a spring form pan, it might be best to remove the spring form from the cake immediately so it collapses more evenly (I didn't do this).